Finally, Bike Newport crowned the Preservation Society of Newport County as Newport’s Bicycle Friendly Business of the Year! The distinction was awarded to the PSNC for friendly support of biking by providing bike racks at every mansion property; encouraging employees to bicycle for fun, fitness and transportation; supporting community bicycle education by providing space and resources; helping to fund and distribute the Newport Bicycle Map; and for being a model partner in all regards since Bike Newport began its efforts to improve and encourage bicycling in 2011. 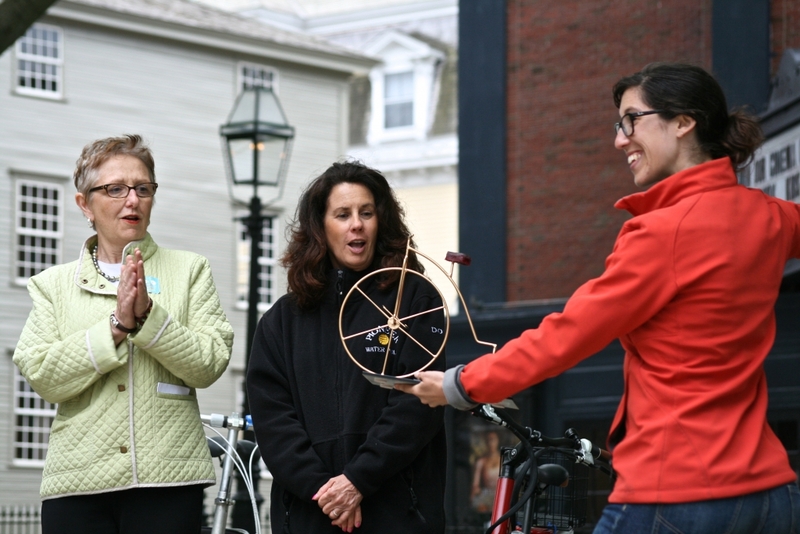 The award itself was a collaboration between Bari Freeman and local artists Howard and Mary Newman, who designed and built this year’s Bike Newport award by combining Bari’s, originally black, Penny Farthing with the Newmans’ new hand made seat, stand and graphics. The colors, including the gold colored Penny Farthing, were specifically selected to fit with the Preservation Society’s Gilded Age aesthetic.